Run. Ride. Read. Repeat. : Where have I been? I feel like I deserve credit for being consistent. I blog for a bit, then vanish for a bit, then pop back up and start blogging again. So here's a quick summary of where I've been since February. My parents have been looking for a house in the Orlando area since last spring. When my mom was down on spring break last year I showed her a house on the west side of town that I knew she would love. The neighborhood had low HOA dues, well maintained homes, and each lot was over 1 acre. She loved the house and the neighborhood, but ultimately decided that the house wasn't for her. So we kept an eye on the neighborhood and told our realtor that as soon as a home appeared for sale we wanted to see it. In November a home was listed and I went to the open house at my moms request. As soon as I saw this house I knew my mom had to have it. The layout was perfect, the pool was the right size with a "hot tub", and the lot was beautiful. By the time she came down over Christmas break the house had unfortunately received a contract on it. After my family returned to Illinois I received a text asking me to see the other house for sale in the neighborhood, which I went to look at with my realtor. The house was nice and had potential so I encouraged my mom to fly down and see it. She flew down and agreed that the house had potential, but needed more work than she wanted to undertake. Our realtor encouraged her to look at the house from November which had the contract fall through. Though my mom was reluctant to look at the home she agreed since it was across the street. I wish I could say that it was love at first sight but I don't think her "I will die to have this house" moment came until our realtor opened the patio doors that led to the lanai and she heard the waterfall from the living room. It was clearly that moment that my mom had to have that house and that it was her place. I'll spare the boring details about hosting my dad during the closing process, or the million texts I've received talking about paint colors and what furniture should go where. But at the beginning of March my mom became the proud owner of "Unicorn Hill". From closing until the end of March I was maintaining not only "Unicorn Hill" but also my own house. It was honestly extremely stressful to be responsible for two houses and I am super grateful that my dad was able to move down immediately so he can get the house ready for not only my family. I've really been working on "pony boot camp" with Cupid. When I first met Cupid a year ago she didn't know what to do under saddle at the canter. When I bought her in January she wasn't much better. Her trot almost perfect and I was able to ask her to extend and collect herself at the trot. We also had success with her working from her hind end, stretching, going straight, and carrying herself. Since then I've been working on teaching her which lead she needs to be on for the canter and what the cues are for the canter. I'm proud to say that she now picks up the correct canter lead the majority of the time, and has actually given me a flying lead change! We've started working on cantering jumps but the major hurdle with this will be regaining my confidence. I've become so comfortable at trotting jumps that cantering them is a bit intimidating. But we've gotten through a few courses with our biggest issue being maintaining the canter through our triple (two stride to three stride). On the topic of courses I've decided to go with my barn to the Sumter Equestrian Hunter/Jumper Show in May. My original plan was to do the Cross Rails Hunters and Equitation on Saturday, and the Long Stirrup Hunters, Equitation, and Classic on Sunday. After speaking with my trainer it was agreed that my original plan is too ambitious. The current plan is that I'll do the Walk Trot Cross Rails Hunter and Equitation, and Green Hunter classes on Saturday, then the Pre-Long Stirrup classes on Sunday. 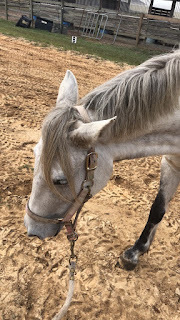 It's a bit embarrassing to be in walk trot classes in my 20s, but I agree with my trainer that it's best for Cupid to have a successful show than have her get frustrated with me if we have issues cantering. Once I get her more comfortable and consistent with the canter then we'll move her to the cross rail/long stirrup divisions. My main hope for her is to eventually do the 2'6" classes, hunter paces, and possibly a few eventing trials with her. But I will have to see if she will be staying at our current barn or moving out to my parents home. The property is zoned for two horses and my parents have convinced me to allow them to set up the property for horses. So far we have the paddocks planned and are working on a "barn" plan that will work for everyone. Nothing is set in stone but at the minimum I'll be able to trailer her to their place and take advantage of the trails. Back in January I joined the Central Florida Community Arts Orchestra. After last year I didn't think Orlando was able to provide me with the type of band that fit me. CFCArts was a last attempt after seeing that a friend had attended one of their performances and I'm so thankful that he recommended them to me. I'm proud to say that I've found my "musical home" in Florida. The CFCArts family has been so welcoming, the conductor is extremely animated, and the music selection is perfect. I happily performed in the Jazz, Joel & John concert a few weeks ago, and am preparing for the American Road Trip concert on June 16th and 17th. I can't wait to share this music selection with everyone and perform one of my favorite pieces American Civil War Fantasy which is a piece I have played with every band I've had the honor of being part of. Now, if anyone was worrying about the status of Cali and Bailey I have an update for you. They're doing fine, as I write this Bailey is stalking Cali to get back the pink "mouse" they're currently obsessed with because we all know the purple mouse isn't good enough. The girls are also extremely happy to have two new friends to torture. Lucy and Kodi have returned to FL and are currently living at "Unicorn Hill". The dogs come over every few days so I can take them on long walks, cuddle with the. and dog sit. Poor Kodi isn't too fond of cats but he tolerates having the cats around and the cats pretty much leave him alone. The Twisted Sisters are more focused on attempting to catch Lucy's -fluffy tail than they are with the cotton ball who runs away. The dogs are extremely happy with their new lives as farm dogs and love to explore my moms neighborhood with me. I can't wait for them to eventually meet Cupid and to one day have them keep me company while I work with her. I'm still running and am currently in my "taper" for the Dark Side 10k and Half Marathon. I try to get in about three work day runs, one long run, and one "therapy" run a week. My work day runs average about 3-4 miles and are typically one of two set loops in my neighborhood. Unfortunately one of these loops might need to be rerouted after the Dark Side events because of a few houses it passes. The long runs have been in a variety of places on Saturday and typically range from 6-14 miles. Finally, the "therapy" run is whatever I'm feeling on Sunday. So anything from a walk around the neighborhood to a few miles at a "thinking" pace. I've been trying to fit in cross training on my bike but have put that on hold until I get the brakes fixed. Overall this is a pretty thorough summary of what's been eating away at my life and keeping me away from the blog. I'd promise to get better at updating this but we all know that won't happen. So, until next time.